Etymology: In reference to the whitish coloration of the leaf veins. Sectional Placement: This species was once believed to be a member of section Cardiolonchium, because of its velvety leaf texture. Due to the species incompatibility in hybridizing efforts with other members of section Cardiolonchium, it is now believed to be more closely related to A. berriozabalense and its sectional status is now unknown. Description: Terrestrial, Stems, 1-2 cm thick with short internodes; Leaves with petioles erect, leaf blade ovate and deeply lobed giving the shape of the blade that of the traditional Valentines Day Heart, upper leaf surface matte and velvety, dark green with silvery white veins, lower leaf surface much lighter green, crystalline in appearance; Inflorescence, peduncle erect, up to two times as long as the petiole; Berries, orange with 1 or 2 large seeds per berry. Check out this species in Croat's online Revision of Mexican species for a more detailed description. Notes: A very popular species in cultivation due to its ease of culture, compact size and very decorative leaf blades. Often confused with Anth. crystallinum which can get much larger, has a yellow spadix and vein color approaching a cream color rather than the crystallin silver of Anth. clarinervium. 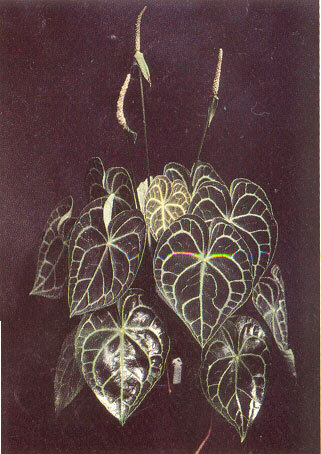 This species is one of the more easily obtained foliage anthuriums. Anth. clarinervium is apomiptic (will set viable seed without pollination) and easily grown from seed. Berries take over a year to ripen.